This is the regular Gold Priced in Pound Sterling update. The last update was in December 2012. 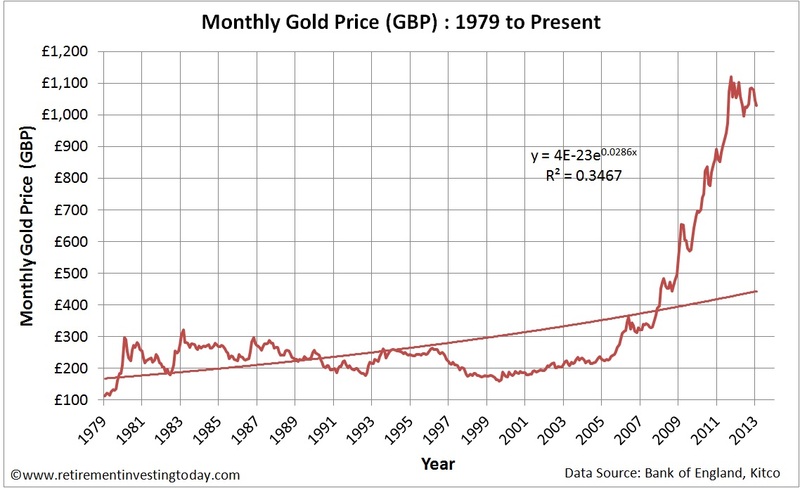 The Nominal Gold Price is currently £1,030.03 which is 1.3% below the December 2012 Price of £1,044.09. Year on Year Nominal Gold Prices are 3.5% below the January 2012 Price of £1,067.76. 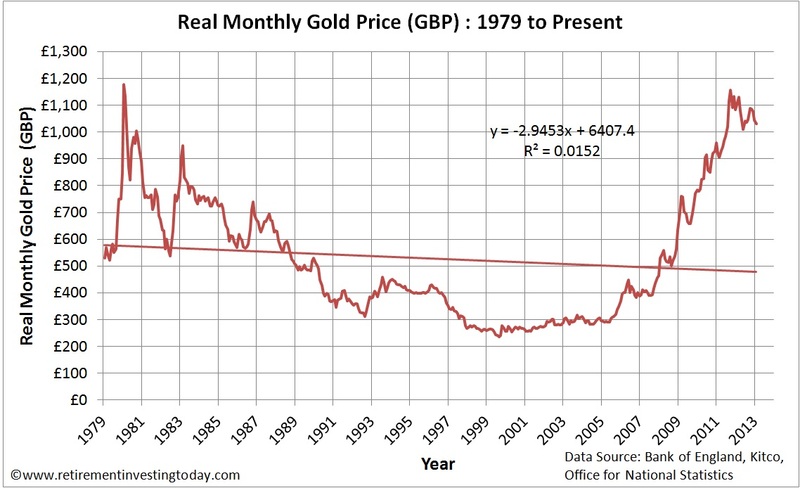 Real Gold Peak Price was £1,176.61 in January 1980. At £1,030.03 we are 12.5% below that peak today. The long run average is £528.29 which is indicating a very large 95% potential overvaluation. Today, I’d also like to introduce a new chart. 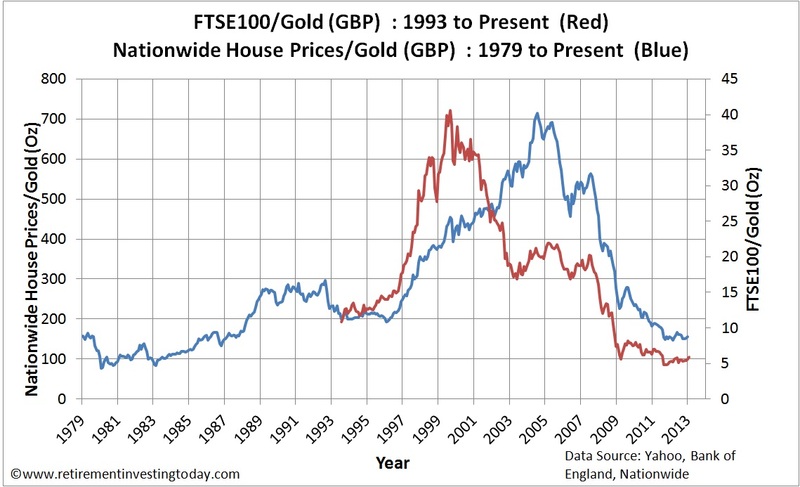 This shows a historical view of how many UK Gold Ounces it would take to either buy a standard UK House, using Nationwide House Prices, or the FTSE 100. This shows that since the early 90’s the FTSE100 today is nearly at record lows were you to be trading Gold for Equities taking just 5.9 Ounces to buy the FTSE100 Index. UK Housing tells a different story. Today it would take 155 Ounces to buy a standard UK house which is twice the low of 76 ounces in January 1980. So where do my gold holdings sit today? I’m at a 4.2% holding, when compared to total portfolio value, against a target of 5.0%. This means I am now 15.7% underweight. Should that move to 25% my mechanical strategy will force me to buy. Last gold price actual taken 06 January 2012. December 2012 and January 2013 inflation is extrapolated from the Retail Prices Index (RPI). Thanks for another useful posting. The second graph begs the question whether gold is really as good a hedge against sterling inflation as is sometimes suggested. Others have suggested it is really a hedge against 'fear', the long decline in the late 80s and 90s reflecting hopes of a more stable post-Cold War global economy. If that was the case though we might have expected a large jump in 2001 or during the Asian Financial Crisis. I wonder if the large variations instead relate more closely to the spread between interest rates and inflation? When interest rates exceed inflation as during the 90s and early 2000s investors worry far less about inflation and think less about gold investment; but when interest rates fall well below inflation (often co-inciding with periods of financial turmoil) gold becomes far more attractive. Might be interesting to plot against the interest rate/inflation spread? Interesting observation and good idea for some analysis (and a possible post). When you say interest rates I'm assuming you are thinking of the Bank of England Rate as opposed to something like LIBOR. Is that what you had in mind? Note that I personally don't hold gold as a hedge against inflation but because I see it as a different asset class that has a different correlation to my other asset classes. That class is a commodity that by holding as "physical" (ie not based on futures contracts) doesn't suffer from contango/backwardation.